All-Day Meeting Packages- Always Free Delivery! Home > Team > TJ! This is Chef TJ Vecere. TJ’s been with Crocodile for a little over a year and says he’s learned a lot in the time he’s been here. Some of the things he’s improved on since he’s been here are… he’s become a more focused worker, learned to manage his time better, and learned to delegate more efficiently. He’s also worked on his leadership. After TJ graduated from the Culinary Institute of America, he moved to Massachusetts to work for a prestigious country club for a season. He then went on a 1.5 month-long road trip where he visited North Carolina, South Carolina, Illinois, Indiana, Kentucky, and Tennessee. He claims his favorite place on that road trip was Nashville, Tennessee, because of the vibe of the city, the food, the lively music scene, and the people. TJ enjoyed Nashville so much, he almost moved there! After TJ’s road trip, he started working as a chef for the Philadelphia Eagles. Pretty cool, right?! 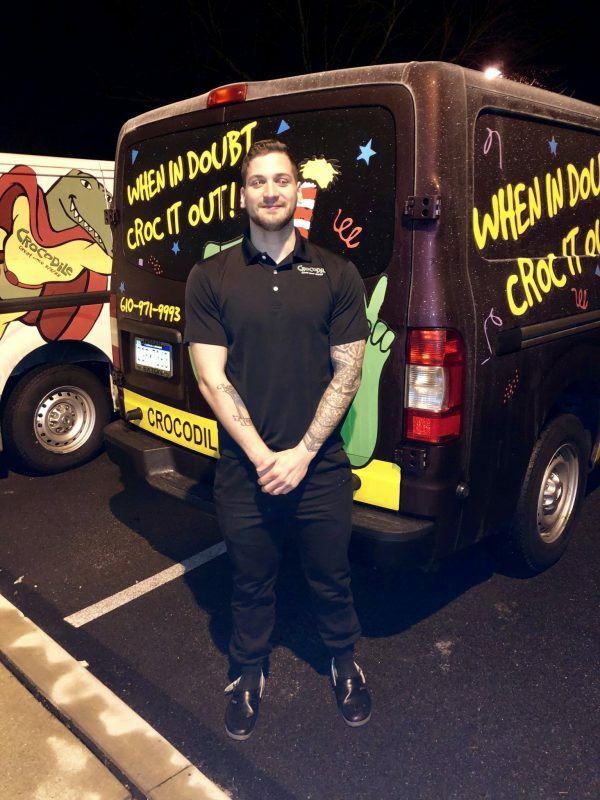 After searching for catering companies, TJ found Croc and now we are lucky to have him! Outside of work, TJ likes to workout and stay active. He likes to fish, hike, and do pretty much anything outdoors. Inside, he likes to play video games and watch movies. His favorite movie is the Rock of Ages because he loves classic rock. We are the innovators in office catering. And we have been doing it under the same ownership since 8/8/88 (same roof, too!!). Crocodile strives to serve the most flavorful, healthy food you’ll find anywhere. We are fanatical about the freshness of our ingredients – many of which are purveyed from local and organic farmers. You will taste the difference! Copyright 2019. Croc Catering. All Rights Reserved.